"Discover Santoro's Gorjuss in a whole new setting with the Gorjuss Christmas collection. For the first time ever you'll find the 'gorjuss girls' in a variety of wintery environments sporting snuggly bobble hats and festive jumpers surrounded by classic Christmas icons like frosty snowflakes holly and poinsettia. This 6 x 6"" paper pack features brand-new designs in a range of festive reds and greens as well as classic Gorjuss shades of purples and blues. " Santoro returns with a stunning storage solution. Store each of your 20 collectable stamps inside th..
Gorjuss returns with this stunning Postal collection. Bursting with new Gorjuss characters and some ..
Gorjuss returns with this stunning collection. Bursting with new Gorjuss characters and some familia.. 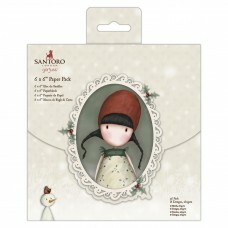 Exclusively from Docrafts, Santoro's Gorjuss returns with the stunning Vintage Rose collection. Thes..
New and exclusively from Docrafts this beautiful Santoro's Gorjuss Wheelable Craft Tote is perfect f.. Exclusively from Docrafts Gorjuss returns with this stunning Postal collection. Bursting with new Go.. These glittery All Occasion Sentiments are the perfect finish to any card. In heavyweight 250gsm..